Our Helpful Finger Size Guide — Form Bespoke Jewellers Ltd. It can be quite difficult to work out finger sizes. Especially if you are estimating the size of someone else’s finger for a surprise gift or proposal. So here are some useful tips to help you. If your partner often wears rings, these could be a very helpful indicator of their finger size. Be sure to make a note of which finger each ring is normally worn on. You can then use our Finger Size Guide to get an estimate measurement, or simply book an appointment with us so we can measure the ring for you. 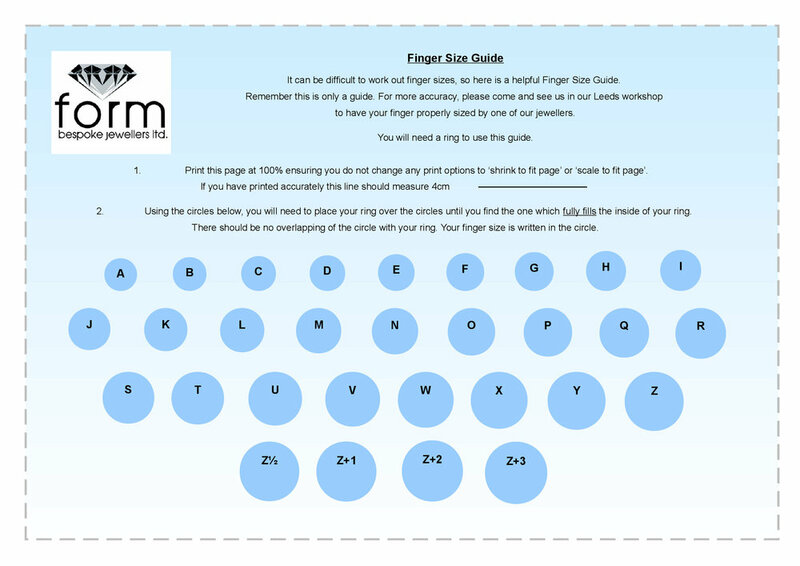 Click on the image below to download our Finger Size Guide. We recommended printing this document at 100% via a laptop/computer to ensure the measurements remain accurate. Please also note: this is only a guide. For more accuracy, please come and see us. It is possible that your partner may have told a friend or family member what finger size they are. So why not simply ask around? Or, if you think his/her friend or family member have similar sized hands to your partner’s, why not borrow their finger to measure. If you can inconspicuously compare your finger to their’s, you may be able to work out some helpful comparisons. For example, your little finger may be a similar size to their ring finger. We can then measure your little finger, which would then give us at least a starting point for working out the best size ring for your partner. 1. Tracing around an existing ring – although seemingly logical, this often proves to have inaccurate results. 2. Randomly guessing – this is a tricky feat even for expert Finger-Size-Estimators (official title!). 3. Measuring his/her finger whilst they sleep – most likely to result in an awake partner and an awkward explaining moment. 4. Chopping their finger off and bringing it in – this can give away the element of a surprise gift/proposal! Remember, rings can always be re-sized (a complimentary process) if they are slightly over or under sized. However, please be aware that if the ring is diamond set, this can be a trickier process.